James Stevenson got his first taste of playing guitar professionally when he joined punk band Chelsea in March 1977 whilst still at school doing A level exams. He was gigging all over England within a couple of weeks. This baptism of fire stood him in good stead for a lifelong career as a guitarist and this was not to be the last time he was thrown in at the deep end when joining bands. James stayed with Chelsea until May 1980, deciding not to go to university, and was regarded as a seasoned pro by the time he was 21. At the time he left Chelsea he'd played on their first two albums, numerous singles and performed gigs all over the UK and Europe. The band also ventured to the US for a tour in February 1979. Chelsea were also the first ever indie band to play on nationwide TV when they performed on BBC's The Old Grey Whistle Test in 1979. After leaving the band he played on UK Subs' singer Charlie Harper's first solo single "Barmy London Army" before being invited by Billy Idol and Tony James to join the freshly reinvented Gen X. This was to be a short lived stint, lasting less than eight months and incorporating just one UK tour before Idol quit for New York and a solo career. Before he had time to wonder what would come next he was invited by his old school friend Henry Badowski to play on his critically acclaimed Life Is A Grand album and simultaneously by his friend Calvin Hayes, Mickie Most's son, to play guitar in the video for his Dad's hottest new signing, Kim Wilde. Kids In America was a huge international hit and James can be seen in the video wealding the white Les Paul Custom that became his trademark. "I was a professional mimer for a year" laughs James, although he did play on various tracks on both her first and second albums. Kim's string of hits took James all over Europe as one of her backing band but he missed playing proper gigs and started talking to his mate Glen Matlock about forming a group. James and Glen had already recorded a single for Magnet records as The Swingers with Mick Rossi from Slaughter And The Dogs - a punk version of the Ronettes' Be My Baby. For Hot Club Calvin was drafted in on drums and singer Steve Allen from Liverpool legends Deaf School and the Original Mirrors undertook vocal duties. Hot Club went straight out on the road in Europe with XTC. The band made two singles for Most's RAK label, the second with new singer Clark Datchler. In 83 James also undertook a European tour with Fischer Z front man John Watts who he'd met whilst doing TV shows in Europe with Kim. Fischer Z were very successful in Europe but hardly known in their native UK. "The John Watts tour was great fun and the first time I'd done a proper arena tour. It was also the first time I ever played with a brass section, what a racket" James noted later. Hot Club fell apart in 1984 due to the member's different visions for the band. Clark and Calvin went on to form Johnny Hates Jazz while Glen and James went on to put a band together with (British TV Series) Auf Wiedersehen Pet star and former Heavy Metal Kids front man and legendary wild man Gary Holton. In early 84 James was invited to join Chelsea rhythm guitarist Dave Martin's band The Smart, recording an album which was never released and undertaking a US tour supporting Orchestral Maneuvers In The Dark. "I felt like I was doing a million things at once around 84 and felt I needed some focus," James later told Guitar Magazine. Glen and James' manager also managed Gene Loves Jezebel and in the autumn of 1985, when GLJ's guitarist had a nervous breakdown at the onset of the band's first US tour, James was asked to fly out and finish the gigs. "I knew nothing about GLJ, but I flew out to New York literally the next day. I tried to learn the set on my Walkman on the flight out." While James was out on the arduous seven week tour Gary Holton died of a drugs overdose. The gene Loves Jezebel tour was beset with a multitude of incidents from the outset, from under-age girls running away to follow the band and the tour manager resigning half way through "Everyone on that tour will have their own perspective of it I'm sure, but I guarantee one thing, everyone will remember it as standing out a million miles from all the other tours they've ever done, the sheer madness of it all." James observed later. At the end of the tour Gene Loves Jezebel frontmen, the twins Jay and Michael Aston, asked him to join permanently. The band's third album, Discover, was the first to feature James and also their goth anthem - Desire. This was followed in 1987 by The House Of Dolls which contained The Motion Of Love - the band's biggest UK hit. The band worked incessantly live and in the studio. Relentless tours of the US were interspaced with Europe and Japan. The tensions between the twins led to Michael's departure from the band in 1989 and the remaining four members continued with Jay as sole frontman. The fifth Album, Kiss Of Life, contained their biggest US hit, Jealous, and James also produced a track for Michael's first solo album (Edith Grove) as well as co-writing three songs for it. Gene Loves Jezebel enjoyed considerable success on both sides of the Atlantic administering their unique band of indie goth rock. The band's sixth album, Heavenly Bodies, was recorded for Savage records, also the US home of David Bowie, in 1992. In an interview in Guitar Player during the tour in the US to promote that album, James was critical of what he regarded as soulless speed guitar playing, that seemed to be in vogue in the US at the time "They've achieved what speed typists have achieved" he stated critically, "they've learnt to move their fingers very quickly." The label folded in 1993 when GLJ was on that same tour in the US promoting their new album and Jay felt GLJ needed to take a hiatus. James then produced and played on a solo album for a singer from his past - Chelsea's Gene October. Life And Struggle came out in 1994. When he had time off he still managed to squeeze in sessions for artists as diverse as Helen Terry, The Hothouse Flowers, Lisa B and Louise! In September 1994 James was invited by his old friend Billy Duffy to play rhythm guitar with The Cult on their forthcoming world tour. "That's where I first met Craig Adams, though he was legendary before," James confirms with some humour. "The tour was great fun for me, just stand at the back and play A and E all night!" The tour still had three months to run, when in March 1995, Ian Astbury left the band. Heavenly Bodies had been a huge hit in Portugal so GLJ regrouped and embarked on a tour of that country. Michael and Jay tried working together again in Los Angeles. 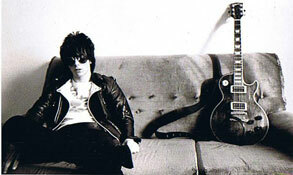 James produced Jay Aston's solo Unpopular Songs album for his own Pink Gun label in 1996 before GLJ tried a reunion with both twins in 1997. It ended with the twins failing to see eye to eye yet again and the final dates were finished without Michael. The bands seventh album - VII, came out later that year. Although originally recorded with Michael, his contributions were removed from the CD before its release. The situation became extremely confused when Michael started using the name Gene Loves Jezebel too, with a band of LA musicians. When Mike Peters was putting together his new electric band in 1997 Billy Duffy suggested he met with James. The pair got on immediately and have been firm friends ever since. James' first gig with Mike was at The Gathering VI in North Wales in January 1998. His first proper recording with Mike was the 5CD Bond set, available only through TheAlarm.com website - although he had played lead on a track from Flesh And Blood, a play Mike wrote the music for. In 2000 Mike decided to use The Alarm moniker again. In 2004 they released the 'In The Poppyfields' album, which spawned the 45 RPM hit single under the fake I.D The Poppyfields. It got to number 28 in the UK charts. The new Alarm album, Under Attack, was released at the end of February 2006. The first single, Superchannel, hit the UK Top 50 at number 24. James also still plays with Gene Loves Jezebel (Jay Aston's version) and also Chelsea - who reformed in 1999 for the infamous Social Chaos tour across North America. In 2000 he also did a tour playing with his old friend Glen Matlock having participated in his Open Mind album. It was James who introduced Mike and Glen, which has resulted in their Dead Men Walking collaboration. In 2002 Gene Loves Jezebel released The Thornfield Sessions - atmospheric reworkings of some of their best known tracks and four new songs. Chelsea released their new album Faster, Cheaper And Better Looking - their first for 20 years with the 79 line-up, to great reviews, in December 2005 in the UK. TKO Records are releasing it with extra tracks in the US in March 2007. Another Alarm studio album, Guerilla Tactics, was released in 2008, and another, Direct Action, in 2010. The Alarm embarked on US tours with The Psychedelic Furs and The Fixx in 2004 and The English Beat in 2008 and annual UK tours, one co-headlining with The Damned in 2008. In 2011 James was invited by New York singer/songwriter Willie Nile to play guitar on his forthcoming UK tour. To date James has joined Willie for three of his UK tours. James has described it as an honour to play with Willie – while Willie has described James as “a class act”. On Nov 29 2011 James played with Willie in Yorkshire, afterwards travelling to Leeds airport and boarding a plane at 4a.m. the next morning flying to Amsterdam where he was collected and driven to the Sinners Day Festival in Belgium to perform with Gene Loves Jezebel and then flying straight back to London for a gig with Willie the same evening. In December 2011 James, Glen Matlock, Clem Burke (Blondie) and singer Gary Twinn formed The International Swingers for a tour of Australia. The band has worked together since, recording and playing sporadic gigs. In January 2013 James released his Shape Of Things To Come CD/EP a three track sampler containing tracks from his recently completed Everything Is Getting Closer to Being Over solo album. 2013 also saw the release of the film Vinyl which featured new tracks written for the soundtrack album and performed by Mike Peters and The Alarm with guest vocals from the films main stars Phil Daniels and Keith Allen. James played bass guitar as well as guitar on the soundtrack. The film, written and directed by Sara Sugarman, is loosely based on the true events surrounding The Poppy Fields and release of the single "45 RPM.". The Alarm took the step of touring the soundtrack album with a showing of the film at selected venues in the U.K. during March and April 2013. Also in 2013 James contributed to Scott Walkers highly acclaimed Bish Bosch album. Legendary British journalist Mick Mercer described James as having played in 72% of all known bands in a review of The Alarm. James has the legend 72% adorning his personalized guitar picks. In July of the same year James was again asked to fill in the rhythm guitarist slot by Billy Duffy, this time for The Cult’s Electric 13 world tour which lasted six months. James expects to be playing with the band in 2014. James’ solo album Everything’s Getting Closer To Being Over is due for release on March 10 2014. Produced by James’ old friend Peter Walsh and co-produced by James and Alarm keyboard player Mark Taylor, it features contributions from GLJ members Chris Bell and Pete Rizzo. Glen Matlock. Geoff Dugmore (Killing Joke) Barriemore Barlow (Jethro Tull – the album was recorded at Barlow’s Doghouse Studio in Henley England). Steve Norman (Spandau Ballet). Craig Adams (The Mission, The Alarm) and The Sexpistilettos (Maggi Ronson, Tracie Hunter and Elizabeth Westwood. Currently James plays with The Cult, The Alarm, Gene Loves Jezebel (Jay Aston’s version), Glen Matlock And The Philistines, The International Swingers and occasionally Chelsea. “It can be quite a juggling act,” James confirms. James has also played on numerous records as a session guitarist and is featured on albums by artists as diverse as Tricky (Maxinquaye), Jimmy Nail (Crocodile Shoes II) and Scott Walker (The Drift, Bish Bosch). He also wrote the music for the UK top ten TV series Hollywood Man and has also composed for TV commercials - most notably for Cadburys Whisper Chocolate bar featuring Ant and Dec.
As a vintage guitar expert he is also an occasional freelance contributor to Guitar And Bass Magazine in the UK.